Now available is our new 30 gallon Filtration System, offering easy “Turn-Key Operation” while providing you with reclaimed clean water to reuse. This system is designed to assist in water and compound filtration, while keeping media clean and glaze-free. The filtration system is easy to use within minutes of receiving. This self-contained system is ideal for all types of mass finishing and includes all necessary components. 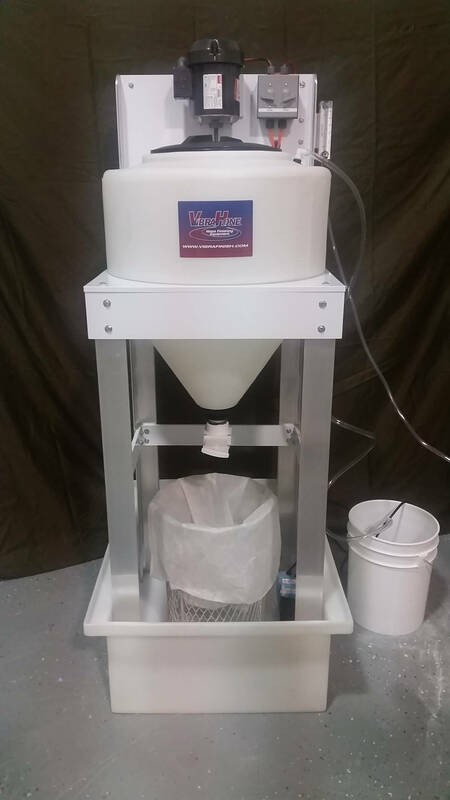 Only requiring 110v outlet to operate, this system includes: 5 sludge bags, 50 pounds of flocculant, 2 recirculating pumps, the 30 gallon mix tank, and 35 gallon holding tank. This is everything needed for an easy turn-key operation.